We rented a wonderful apartment in South Kensington, a charming section of London. This is the door of the house, one in a row of identical houses, most probably containing multiple apartments. It was a beautiful day when we went across the Thames to see the Royal Watercolor Society Exhibit at Bankside Gallery. 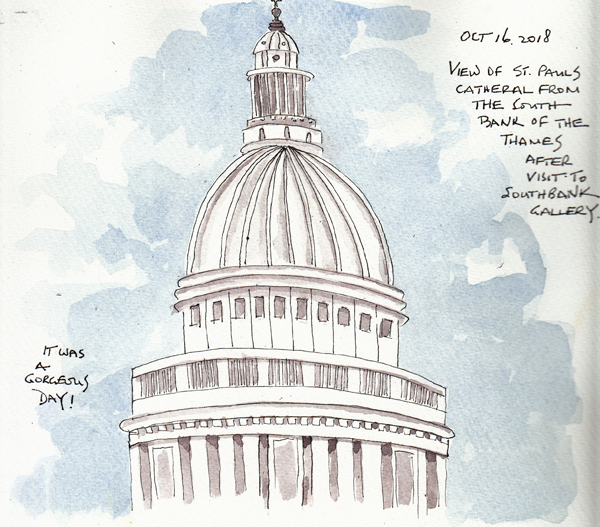 I loved taking a few minutes to draw/paint the roof of St. Paul's Cathedral. We then walked back across the Millenium Bridge. 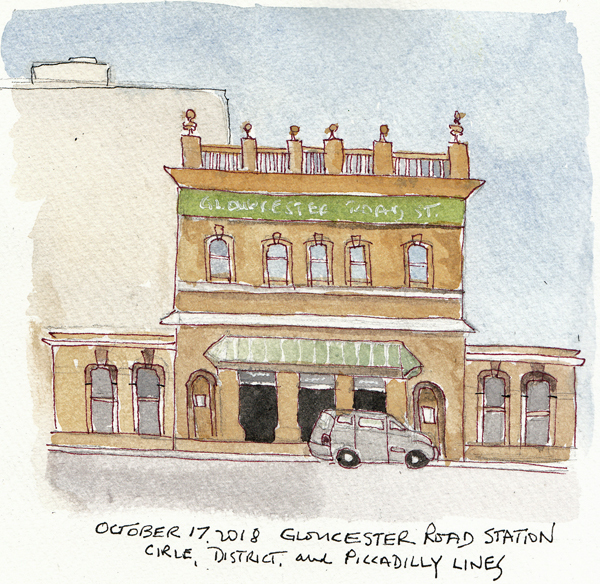 Gloucester Station was our local Tube Station and it was wonderful because the Circle, District, and Piccadilly lines all stopped there. That meant that we could take the Underground from Heathrow Airport directly to our neighborhood. There were many restaurants, coffee shops, food stores, and bakeries right around the station - a great convenience. 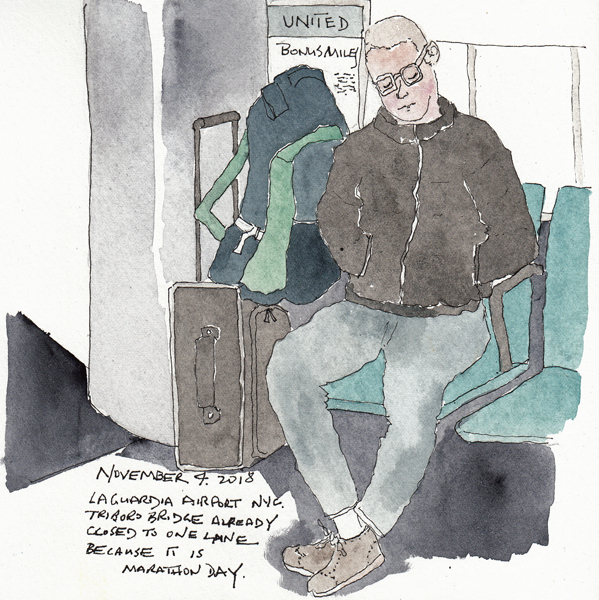 I went to the airport very early in the morning because of road closures for the New York Marathon and another one of the early arrivals took a long nap - and I had time to both draw and paint him. 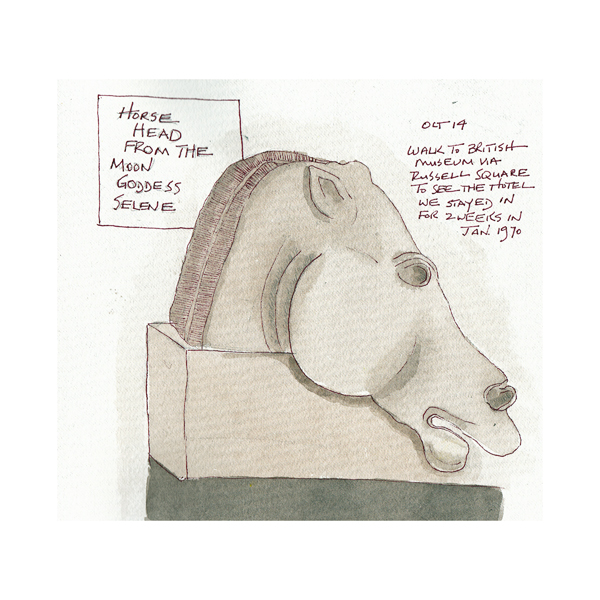 Home from Quilt Festival - tired, but happy - and I'm posting a drawing inspired by my visit to the Delacroix exhibit several weeks ago. I sketched Delacroix's Tanner with graphite pencil when I was at the Metropolitan Museum of Art several weeks ago. 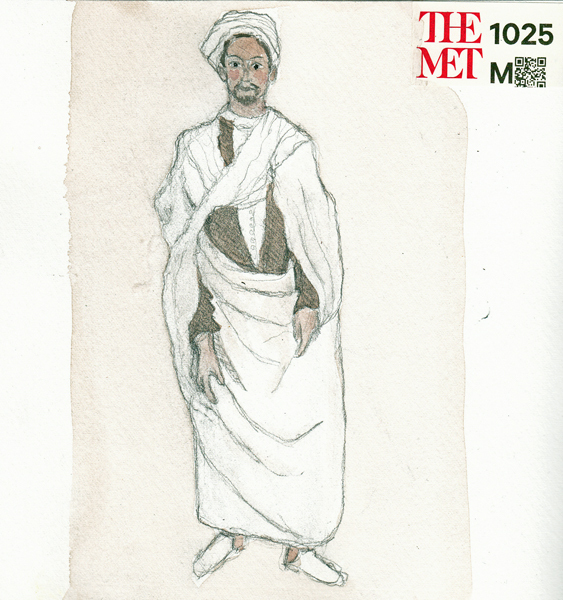 His Morocco watercolors are among my favorites, and I finally painted it using the colors he used for the clothing and the background. Below is the first drawing and the painted version. 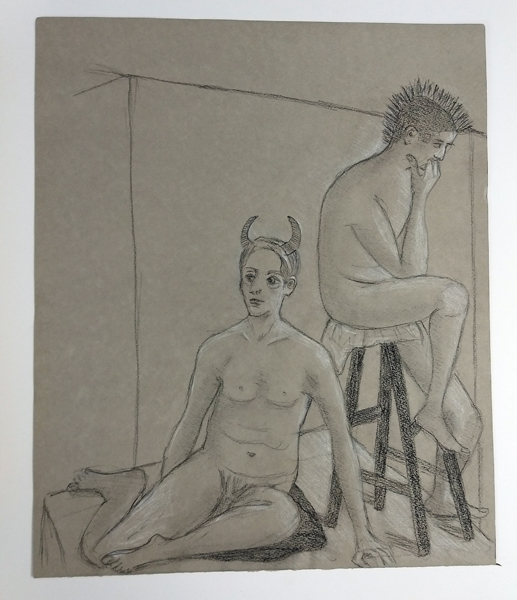 This week in our figure drawing class we used toned paper and black and white media- my pencils were Conte. 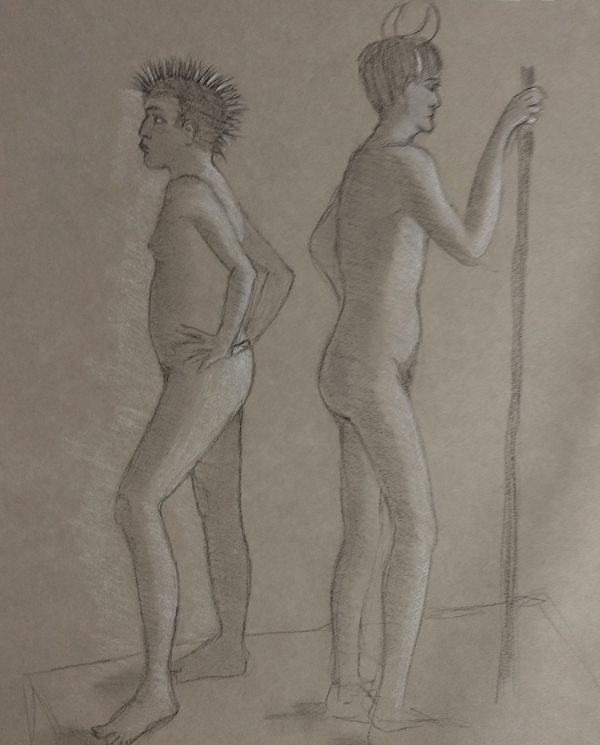 We had two models and two poses, each about 40 minutes to draw the two models together. This was one of my goals, so I'm glad we did it, and I think I learned about how to add dark and light tones - with the paper representing the mid-value. I actually made myself a sketchbook of toned paper last year and had picked out various types of black and white pencils, and tested them all in preparation for my project. Then I fractured my wrist and that was a project I deferred. It was Halloween and the older male model had on devil horns and the younger one had his real Mohawk hair gelled into position. 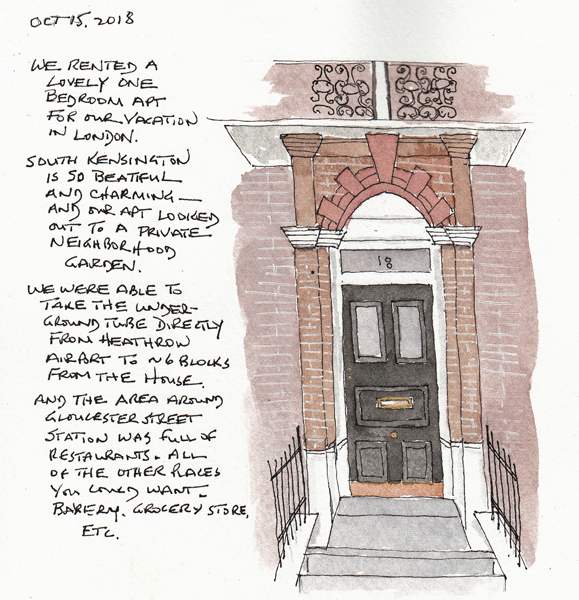 I'm slowly finishing more of the sketchbook pages in my London Sketchbook All of the pages were drawn quickly in pencil, then inked with a Sakura Pigma Micron pen. I was then able to paint them later, using a photograph taken when I was drawing if I needed more information. Occasionally I can find a place to sit, draw, and paint at one time. 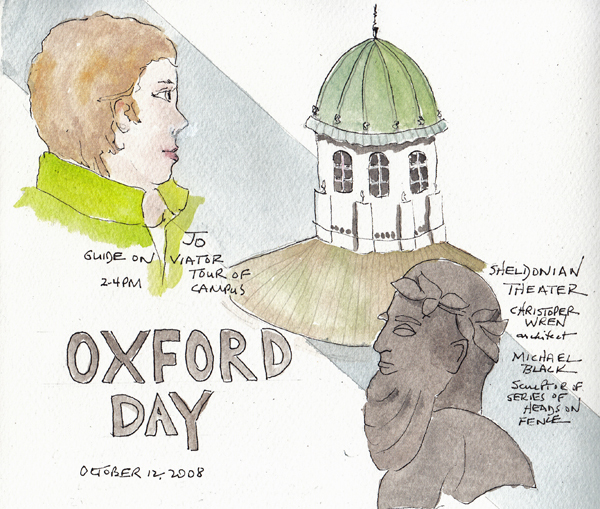 Oxford Day: We took the train from London for a visit to University Oxford and visited Blackwell's AMAZING Book Shop when we arrived, to avoid the rain and winds. But the sun peaked through the clouds just as our University tour began and we finally saw the gorgeous campus and learned more about the history of their 38 colleges. 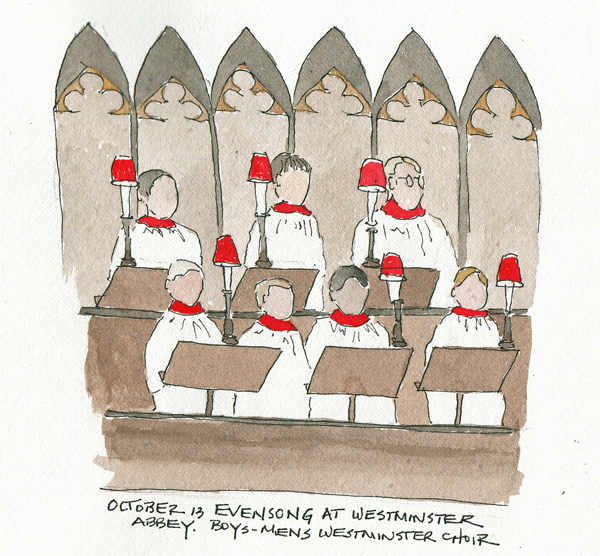 Evensong at Westminster Abbey with the Westminster Choir: It is a beautiful way to see the Abbey during a wonderful choral program. This was a small area of the choir that I could see from our seats. 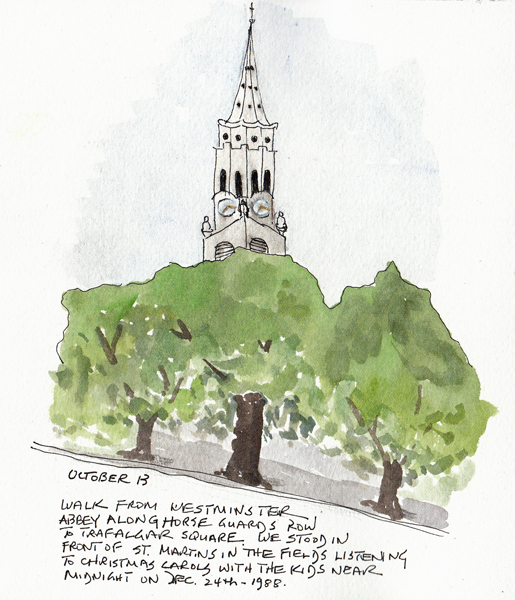 St.Martins of the Fields Church: It was a beautiful London Day and fun to sketch the spire from Trafalgar Square after a walk over from Westminster Abbey. It brought back memories of Christmas Carols in front of the Church on Christmas Eve with our family many years ago.